On July 31, 2017, TeeTee Dangerfield was found dead with multiple gunshot wounds in front of her College Park apartment complex, just outside Atlanta, Georgia. According to news reports, she had been a natural leader, shop steward of her union's local, and beloved among friends for her nurturing ways. 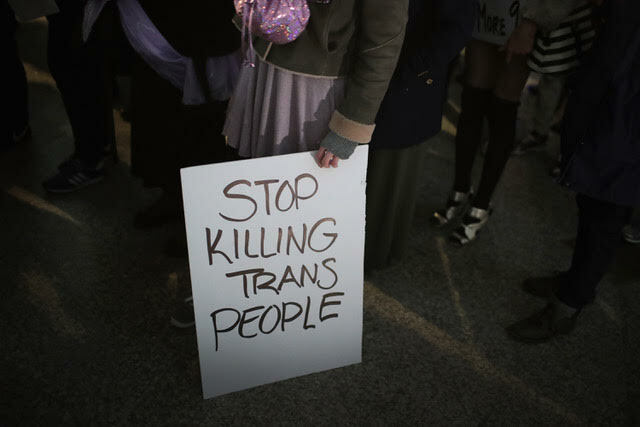 And as the reports mentioned, she was the 16th transgender person murdered in 2017, part of a rising wave of brutality targeting sexual minorities. In August 2017, the National Coalition of Anti-Violence Programs (NCAVP) published a report detailing anti-LGBTQ hate violence that was notable for its mid-year timing: "[We] decided to issue this report early," the report states, "in hopes that it will raise awareness of the crisis." Alexis Dinno, an epidemiologist and associate professor at the OHSU-PSU School of Public Health in Portland, Oregon, hoped to turn a more scientific lens on media reports of transgender homicides. In a study published last year, she found that homicide rates among young transgender people as a whole were lower than those for young people who are not transgender. But there was an important exception: young black and Latina transfeminine people were at an increased risk for homicide compared with their non-transgender peers. And while social media has enabled media and law enforcement officials to crowdsource demographic details about victims of homicide, Cooper thinks the rise of social media has also encouraged violence against transgender people by spreading and normalizing transphobic rhetoric. Halting that violence, she said, will require broad efforts to educate the public about transgender people.